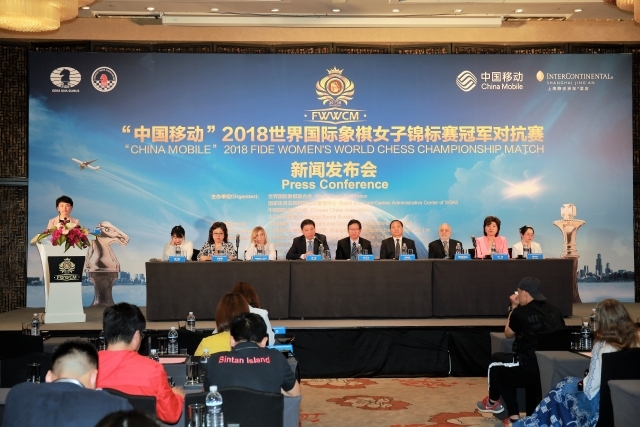 Women's World Chess Championship Match 2018 between the Women`s World Chess Champion Tan Zhongyi and the winner of FIDE Grand Prix Series Ju Wenjun will be organized from 2nd to 9th of May in Shanghai and the latter half from 11th to 20th May in Chongqing. 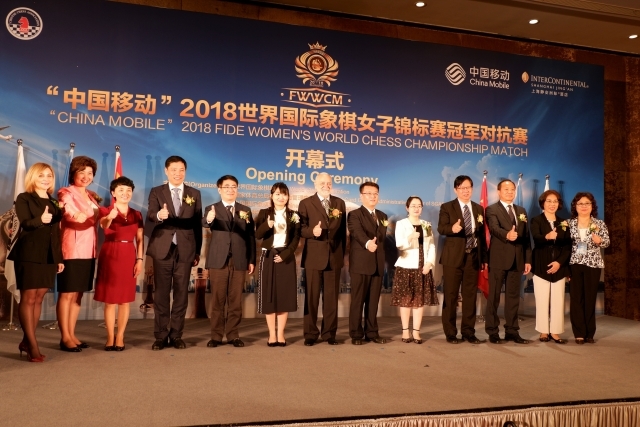 Challenger Ju Wenjun selected the Black queen with a white base at the opening ceremony in Shanghai and will play white in the first game against Tan Zhongyi. Players will switch colours after 4 games. The time control for the game is: 90 minutes for the first 40 moves, followed by 30 minutes for the rest of the game, with an increment of 30 seconds per move starting from move one. The winner of the ten-game match is the first player to reach 5.5 points or more. If the scores are level after the regular ten games, after a new drawing of colours, four tie-break games will be played, with 25 minutes for each player and an increment of ten seconds after each move. If the scores are level after the four rapid games, then, after a new drawing of colours, a match of two games will be played with a time control of five minutes plus three seconds' increment after each move. In case of a level score, another two-game match will be played to determine a winner. If there is still no winner after five such matches (i.e. after ten games), one sudden-death game will be played. This involves a drawing of lots, the winner being able to choose the colour. The player with the white pieces receives five minutes, the player with the black pieces four minutes, with an increment of three seconds per move from move 61 on. In case of a draw, the player with the black pieces is declared the winner. The games will start at 3 p.m. local time. The prize fund for this chess match is 200,000 Euros and will be split between the players as follows: 60% for the winner and 40% to the loser if the match ends within the 10 regular games. In case the winner is decided by tie-break games, she will receive 55% and loser 45%.